complete treatment for 4 weeks. Reduces circumference 2cm in 4 weeks while you sleep. In MenRedux-complex slimming and toning. Cosmetic activity of Man Somatoline Cosmetic Treatment Belly and Abdomen Intensive Night manifested from the first application: after a few minutes of massage, you can feel a cooling sensation, followed by a heating effect, possibly accompanied by redness and slight tingling . This combined action of 'hot-cold' stimulates superficial cutaneous microcirculation and facilitates slimming action treatment. 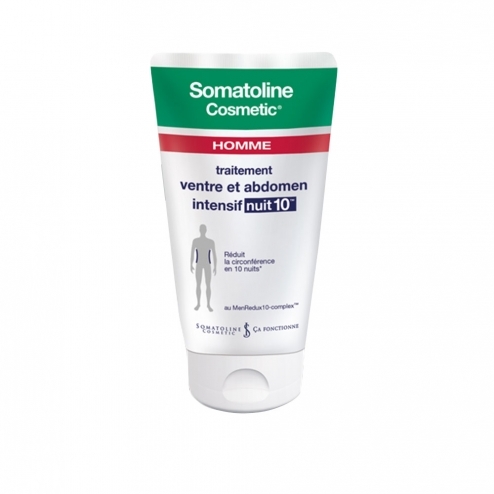 Man Somatoline Cosmetic Treatment Belly and Abdomen Intensive Night is an innovative cosmetic cream, specially designed to combat human localized fat (belly and love handles) with one application every evening. It takes advantage of the night time, when the skin is more receptive, for intensive and rapid reduction centimeter action. It contains an exclusive active complex cosmetic, the MenRedux-complex enriched with green coffee extract, Caobromine and cryo-thermal cosmetic ingredients that, through the application of massage helps reduce localized fat. Instrumental clinical test conducted on 36 men with superficial localized fat in the abdominal region, shows that through constant and correct use and application by massage, Somatolone Male Cosmetic Treatment Belly and Abdomen Intensive Night reduced the circumference the abdominal area of ​​2 cm (average) in 4 weeks thanks to an application each night. Apply a dab of product every night before sleeping, on the areas to be treated massaging with circular motions until absorbed. Regular use even after 4 weeks of treatment, helps maintain the result. Formula INCI: Aqua, caprylic (capric triglyceride), cetearyl isononanoate, glycerin, Cera alba, stearic acid, alcohol denat, menthol, Butyrospermum parkii extract, propylene glycol, octyldodecanol, acrylates copolymer, cetyl alcohol, glyceryl stearate, dimethicone, tricontanyl PVP, perfume, hydroxyethyl cellulose, zingimber officinale extract, coffea arabica extract, Paullina cupana extract, theobroma cacao extract, menthyl lacatate, PPG-26-buteth-26, PEG-40 hydrogenated castor oil, ethyl nicotinate, kigelia africana extract, quilaja saponaria extract, bladderwrack vesiculosus extract, caffeine HCI, butylene glycol, triethanolamine, algin, disodium EDTA, tocopherol, benzyl alcohol, phenoxyethanol, potassium sorbate, methylparaben, ethylparaben, butylparaben, isobutylparaben, propylparaben, CI 42090, CI 19140, benzophenone-4, benzyl salicylate, eugenol , limonene, linalool.